If your refrigerator was purchased before 2008 chances are it contains incandescent bulbs. Incandescent bulbs are far less efficient than the new LED bulbs, but in a refrigerator they create an even bigger issue, the get really hot. Heat is the last thing you ever want inside your refrigerator. Newer refrigerators all come with LED bulbs, but there is no reason that you can't upgrade your existing fridge. My Frigidaire stainless steel refrigerator was purchased in 2004 and contains five incandescent bulbs. Four in the refrigerator and one in the freezer. I started by removing the legacy bulbs so that I could take them with me to the home improvement store to match the bases and size. I burnt my fingers pretty badly while unscrewing the second of four bulbs in the fridge. That goes to show how quickly they heat up and how much heat they create in the fridge. I ended up having to wear gloves to unscrew the other bulbs. I found that I had two different size bases on the bulbs. All were 40 watt bulbs. I had no trouble finding the right size base bulbs for the one size at the home improvement store. For the other size I had to order from Amazon. When I returned home I quickly installed the new bulbs and found that the light in the fridge was very comparable. After having the door open for over a minute the bulbs were still cool to touch which should provide a big improvement. 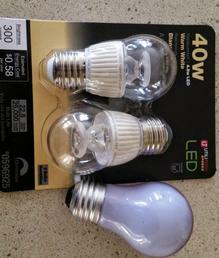 The new bulbs cost me $35 which seems expensive, but they are rated to last for years most likely outliving the fridge itself. More importantly the efficiency estimates that I have read state that they will save me roughly $55 annualy on the overall refrigerator's electrical use. A simple upgrade that in the long run saves money.